Expansion for up to 3 PCIe CardsProvides three PCIe 3.0 slots within the storage chassis that allow the users to make an easy expansion of varied specialty PCIe cards to the Thunderbolt 3 Mac. Except the necessary RAID adapter card to be added, the professionals can still choose to attach two more pro cards such as video capture, video transcoding, audio accelerator, network card and so on in the NA381TB3 to add extra performance to Thunderbolt Mac. By the two Thunderbolt™ 3 (USB-C) ports, users can have the first port to computer while the second port to daisy-chain of up to five additional Thunderbolt peripheral devices with two 4K displays or one 5K display being positioned at the very end of the chain. USB 3.1 Gen 2 (10Gbps) is also supported: connecting one USB device to the second port for application is available. 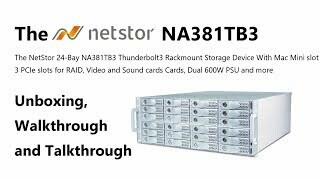 If you buy this NetStor 24-Bay Thunderbolt3 and hard drives we do free build and test for the unit and hard drives. So you can use this device straight out of the box. All free of charge in NA381TB3 price. SAS/SATA 12Gbit 28-Port; Dual-Core; Six x4 Internal SFF8643, One x4 External SFF8644 card. Great speeds and Maximum capacity !